Welcome to the world of Christmas adverts, where it's always snowing, the turkey's never overcooked, and the trees never shed their needles. Every year, some of Britain's biggest retailers turn TV commercial breaks into a winter wonderland. We all know it's a long way from reality, but it still looks like a nice place to visit - so just how far away is it? Picture the scene. Snowflakes flutter gently from a pale sky onto a glistening winterscape below, where woollen-clad, rosy-cheeked children build a perfectly rounded snowman. This is the wondrous scene depicted in many a Christmas advert - and this year is no different. 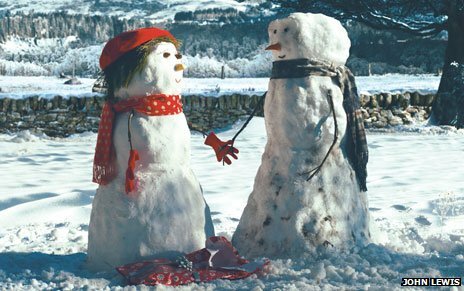 Take the John Lewis advert, featuring aforementioned snowman and kids, with snow-girlfriend thrown in for good measure. But how realistic is a white Christmas day? Not very. Met Office records suggest there has only been a widespread covering of snow four times in the past 51 years - but a snowflake has fallen on Christmas day 38 times. So, we can probably expect more than half of all our Christmases to be white-ish. BBC weather forecaster Sara Thornton says it is too early to say if we will see snow this Christmas: "In some parts of the UK, you are statistically more likely to see a white Good Friday than a white Christmas day. "As romantic as these Christmas adverts are, some children will never have seen snow falling on Christmas day." This year's Morrisons advert depicts a mother grimly contemplating the many tasks she has to complete before the big day - wrestling the turkey, peeling a hillock of brussels sprouts, entertaining an entire neighbourhood's worth of relatives. But just when you think mum's about to start looking for cheap flights to Tenerife, she manages a wan smile and says, "But it's Christmas, and I wouldn't have it any other way." Asda also focuses on a frazzled-looking mum, whose reward for single-handedly masterminding festivities, is a rather uncomfortable-looking pouffe at the dinner table. "Behind every great Christmas there's Mum," says the voiceover. Sexist? The Asda campaign has attracted 191 complaints to the Advertising Standards Authority. Writing in the Independent, Becca Day Preston calls the advert "insultingly retrograde and simplistic". 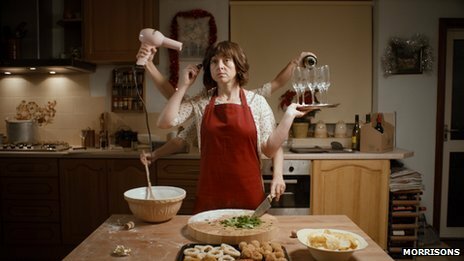 But are these campaigns simply reflecting the fact that, actually, mums do most of the work at Christmas? Asda has apologised for any offence: "Our ad depicts what many of the 16 million mums who shop in Asda tell us they feel, and is intended to be light-hearted and fun and in the main that's how it's been received." Siobhan Freegard, founder of Netmums, says the supermarkets have got it spot on. "When it comes down to it, in the majority of homes it is the mum who is in overall control of Christmas," she says. Mums discussing the ads on the Netmums forum "appreciate the recognition", she says. But Tom Herbert, a fifth-generation baker and father of four, doesn't like the way husbands and fathers are always portrayed as incompetent and lazy. He says Christmas is a family effort among his relatives and friends. "All the men I know - pretty much without exception - love the whole feast and getting together thing. I don't know any guy that can sit on his bottom and watch the telly while their other half does all the cooking. "It's a missed opportunity if it's just left to one person. The more collaborative it is, the more fun for everyone." Christmas adverts are full of smiles, friendly faces, laughter and joy. It's as if everyone is united in harmonious celebration. If only. Relate says 68% of people expect to row over the holidays, with 39% citing Christmas day as the time they are most likely to have a bust up. BBC Magazine: Season of ill will? Childline received almost 50,000 calls for help from children and young people in the 12 days from 24 December to 4 January last year and the Samaritans expects about 193,000 people will call this Christmas. But of the more trivial spats, Arthur Smith, star of TV's Grumpy Old Men, says it's a "fiction" that everyone gets along at Christmas. "There is this idea that it's all about everyone having fun together. But people are financially stretched and can't afford the present the missus wants, the Christmas tree won't fit in the house, and there's plenty of flying crockery at lunch." And Stuart Prebble, the author of Grumpy Old Christmas, says the season "is an excellent time for those of us whose lives are not picture-book perfect to be reminded that everyone other than us is happy, fulfilled, balanced and contented". And Christmas ads are the media equivalent of those excruciating round-robin letters, he says: "'Freddie has just got a first, we've just come back from the Maldives, Melanie has just discovered a cure for cancer, and James has won a Nobel prize." To some, Caroline Sullivan's Christmas Day might sound too depressing for words. The music journalist spends it alone, starting the day with an indulgent cooked breakfast, then later a special, dutifully prepared lunch, and perhaps a nice walk. "John Lewis has been quick off the blocks with its blockbuster £6m Christmas ad. Arriving with much marketing fanfare and a telegenic seven-year-old, much of Middle England has been reduced to tears by a simple feel-good message." Ad breakdown: Olympic gold or also ran? Does the farming boyband match the rural rappers? "It's a day of complete indulgence. I don't have to talk to anybody or do anything I don't want to do. I get to do all of things that I don't get a chance to do during the rest of the year because I'm either too busy, or too conscientious to spend an entire day sitting on the sofa reading," she says. "A lot of people don't think that's a fun way to spend Christmas - but to me it's bliss." The charity Friends of the Elderly says 500,000 elderly people, will spend Christmas alone this year, while those from broken families can expect to face yet another year of divvying their time up between various relatives. And spare a thought, too, for the 35,000 British military personnel who will spend Christmas serving abroad, without their families. Author Will Self writes about a Christmas he spent alone as a 20-year-old student after his parents separated. "I like to think I understood that very day... that deliberately being alone on Christmas Day was a bad move; that it was tempting fate to toy with isolation." Sullivan says it might not be for everyone but it's worth a try: "I always say to friends 'Do it, be on your own.'" If the plethora of pine needles in this year's Christmas adverts is anything to go by, everyone wants a little piece of Norwegian forest in their living room. There are bauble-decorated trees in the Boots, Argos and Matalanads, magic trees in the Coca-Cola campaign, and then there's theIceland ad, where a young girl isn't exactly rockin' around a Christmas tree, but has a distinct spring in her step as she walks through what is almost a forest of them. Even the John Lewis advert has the snow woman's hair made of pine needles. But only a fifth of people will buy a real Christmas tree this year, according to Which? Nearly 50% plan on having a "realistic" artificial tree, and 19% favour a "coloured artificial tree". Of course for some people, it's got to be the real deal. Harry Brightwell from the British Christmas Tree Growers Association, says between six and eight million real Christmas trees are sold in the UK every year. They are part of the tradition, and purchasing them is a "family outing that signifies the start of Christmas". But Stuart Prebble thinks there is nothing particularly festive about uprooting "millions and millions of innocent spruces". "The needles start dropping the moment you've paid for it, you can't get it in the car, and when you do, you'll be picking the pine out of your upholstery for the next year. "You always buy one that's too big for your house. And what do you do with it when you've finished with it - throw it over the balcony?" Wendy Mitchell, of the Charity Retail Association, says that although charity shops do not hold figures on donations through the year, there is usually "an uplift" after Christmas, often because of unwanted gifts. Martin Lewis, of MoneySavingExpert.com, suggests a radical solution to not getting what you want - banning Christmas presents. "Across the country people are growling at the enforced obligation to waste money on tat they can't afford, for people who won't use it. Festive gift-giving has lost its point, risks doing more harm than good, misteaches our children about values and kills the joy of anticipation of what should be a joyous time," he writes in the Daily Telegraph. The Mothers' Union suggests parents could ditch Christmas lists for their children. "The majority of parents we spoke to, said that Christmas lists create disappointment for children if they do not receive all the gifts that they have asked for," says Reg Bailey, the charity's chief executive. Waitrose has gone out on a limb this year, shunning the familiar all-singing-all-dancing Christmas advert for something much more simple. It says its stripped-back TV advert, which features Delia Smith and Heston Blumenthal "in an empty studio, with just a three foot high Perspex fixture and some green plastic tokens as props" will save £1m, which the company will donate to good causes instead. Both Delia and Heston have waived their appearance fees. 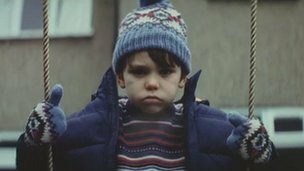 The pared-down ad has been broadly welcomed by charities, as Christmas is a critical time for fundraising. The Charities Aid Foundation says donations go up by 19% in December. Professor Cathy Pharoah, co-director of the Centre for Giving and Philanthropy, cites a 2009 Economic and Social Research Council report which suggests a 5% rise in the number of people who give in December, although the size of gifts, on average, stays the same. The biggest increase is among 25-34-year-olds - up from 40% to 48% in December - and the over-65s. Families on lower incomes are also particularly charitable at Christmas. Although people tend to donate more to charities, she says it is not the most significant way people increase their spending at Christmas. Gifts for other people, and spending on alcohol and tobacco, top their list of priorities. "It's not a myth that people are giving, but there are limits to our additional generosity." But is Waitrose's no-frills approach really that cheap? "Any fool knows that the most expensive part of any advertising campaign is buying those multimillion pound slots on prime time television," saysThe Times's Giles Coren. "The incidental costs of dressing a set barely show up on the balance sheet." 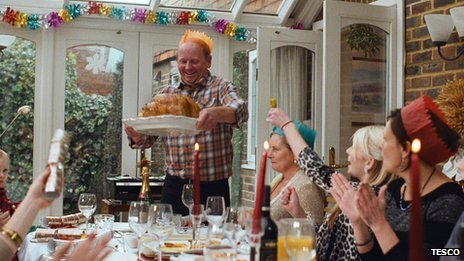 Waitrose says the campaign is "absolutely genuine" and the £1m will make a "meaningful difference" to hundreds of charities all over the country.